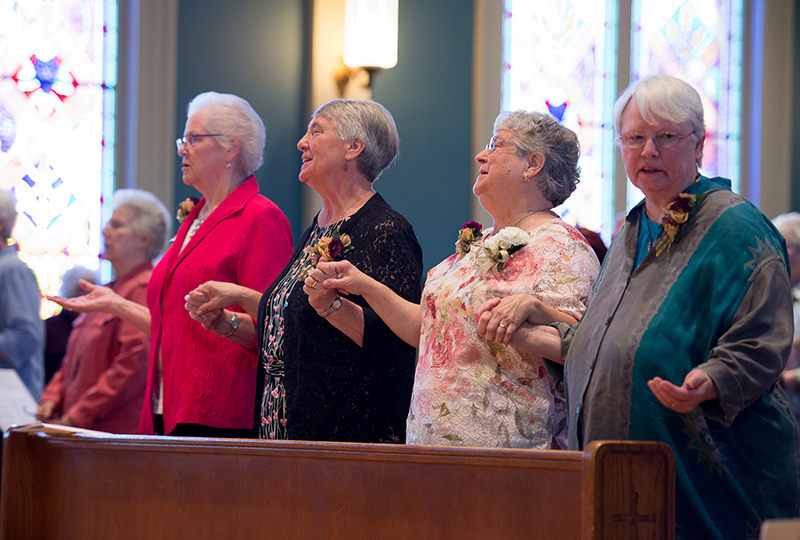 We are happy to present to you our Jubilarians who are celebrating milestones as Sisters of the Holy Names of Jesus and Mary for 50 years from First Profession. May this year of Jubilee be one of many blessings and graces for you, Jubilarians. 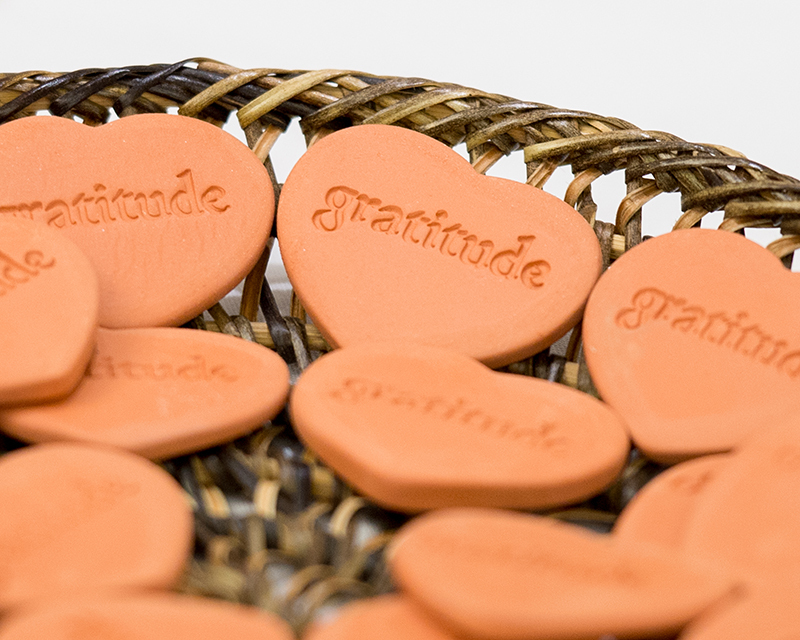 We rejoice with you and look forward to celebrating. L-R: Karyl Fredricks, SNJM and Bea Hall, SNJM. 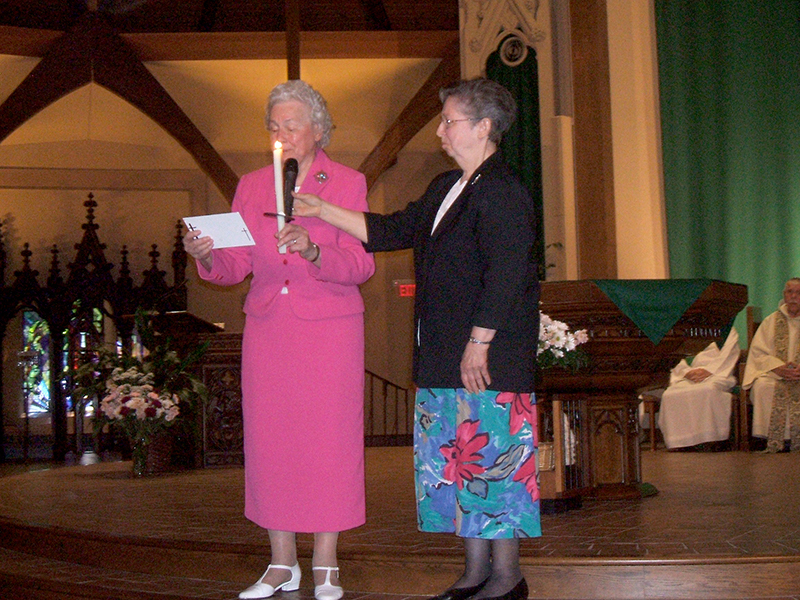 Karyl Fredricks, SNJM (Albany) celebrated her 60th Jubilee on June 17 at Christ the King Church, the parish where she worships and where she has also been involved in faith formation programs for many years. The celebration continued with dinner at the Academy of the Holy Names. Karyl Fredricks, SNJM (front row center in pink suit) is surrounded by family, friends and Sisters at the Academy of the Holy Names. 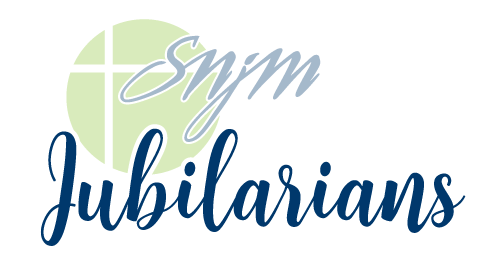 L-R: Ann Gilchrist, SNJM, Marilyn Miller, SNJM, Carol Sellman, SNJM, Cheryl Milner, SNJM, Susan Maloney, SNJM and Annamarie Therese Colapietro, SNJM. On April 7, the rain clouds parted in Los Gatos, CA in time for the lovely California Golden Jubilee celebration. 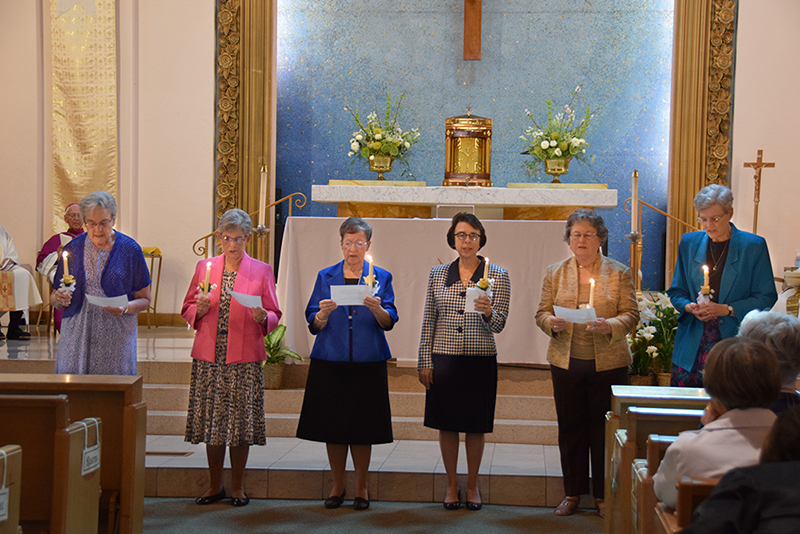 With great rejoicing Annamarie Therese Colapietro, SNJM (East Bay), Ann Gilchrist, SNJM (San Francisco), Susan Marie Maloney, SNJM (Southern CA), Marilyn Miller, SNJM (San Francisco), Cheryl Milner, SNJM (South Bay) and Carol Sellman, SNJM (East Bay) were honored at a Eucharistic Celebration at Saint Mary Church, where they made their first profession of vows 50 years ago. The presider was Co-Director of Campus Ministry at Holy Names University, Sal Ragusa, SDS. Mary Pat LeRoy, SNJM (South Bay) delivered the homily on the theme of Jesus’ commandment of love found in John’s Gospel. 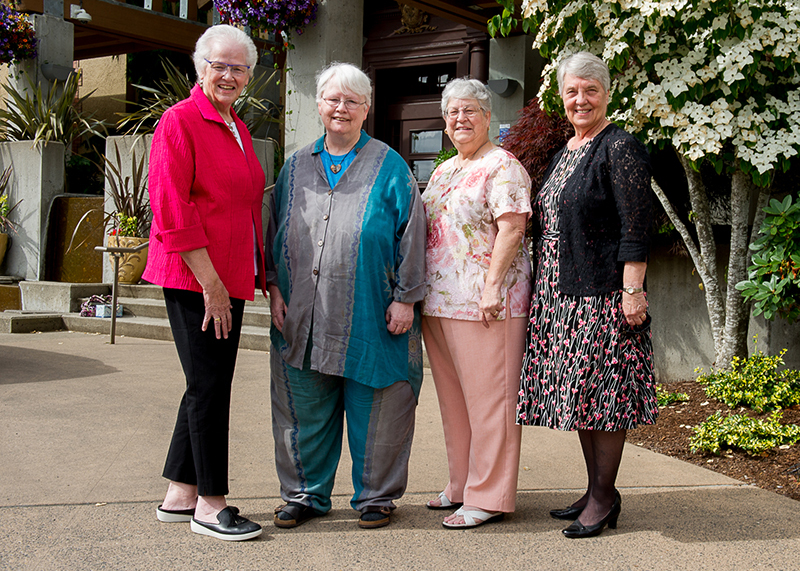 L-R: Moe Oliver, SNJM, Kathryn Knoll, SNJM, Janet Marcisz, SNJM and Mary Ann Martinmaas, SNJM. 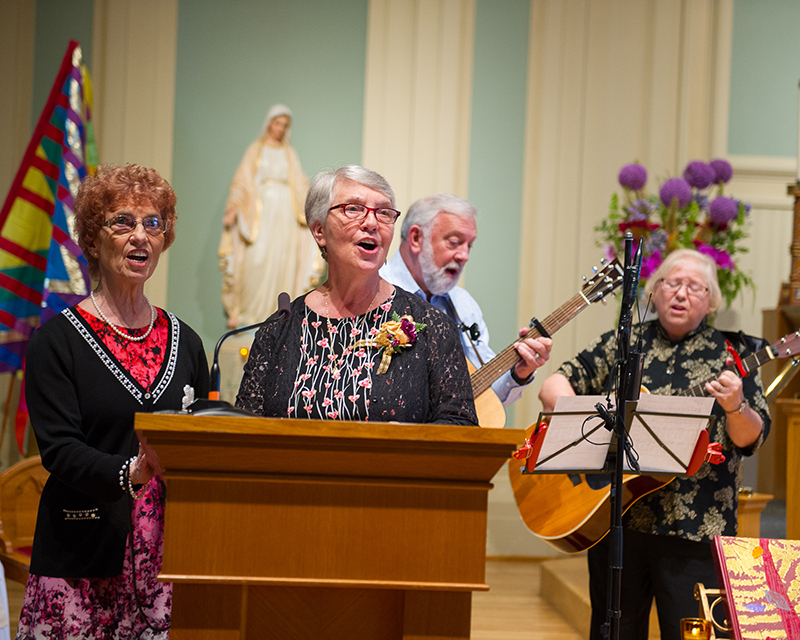 The Chapel of the Holy Names at Marylhurst was full on June 16 for the joyous celebration of the 50-year Jubilee of Moe Oliver, SNJM, Kathryn Knoll, SNJM (both Marylhurst), Janet Marcisz, SNJM and Mary Ann Martinmaas, SNJM (both Southern OR). 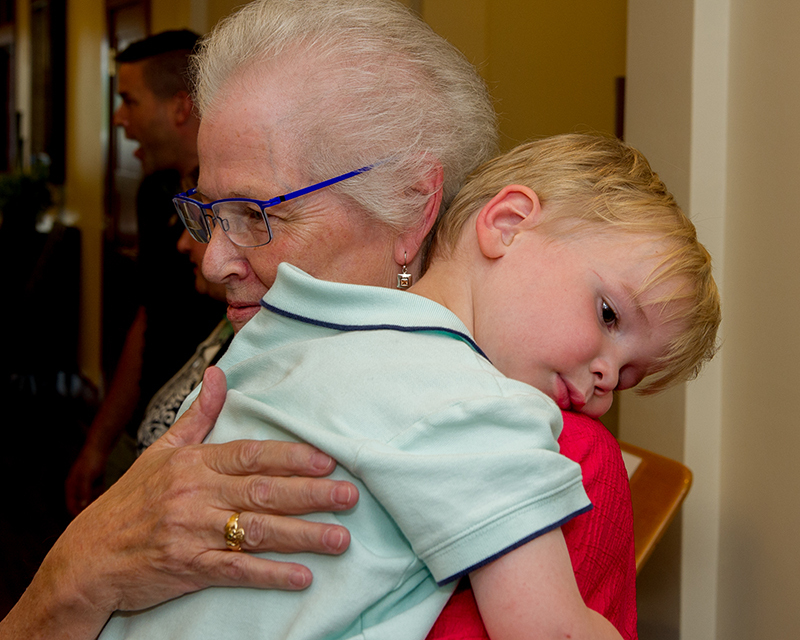 From preschoolers waving mini-sized banners in the opening procession to the wonderful music of the guitar group, the cantor Anita Lindsay and the SNJM Oregon Chamber Ensemble, the occasion was a time of gladness for everyone. 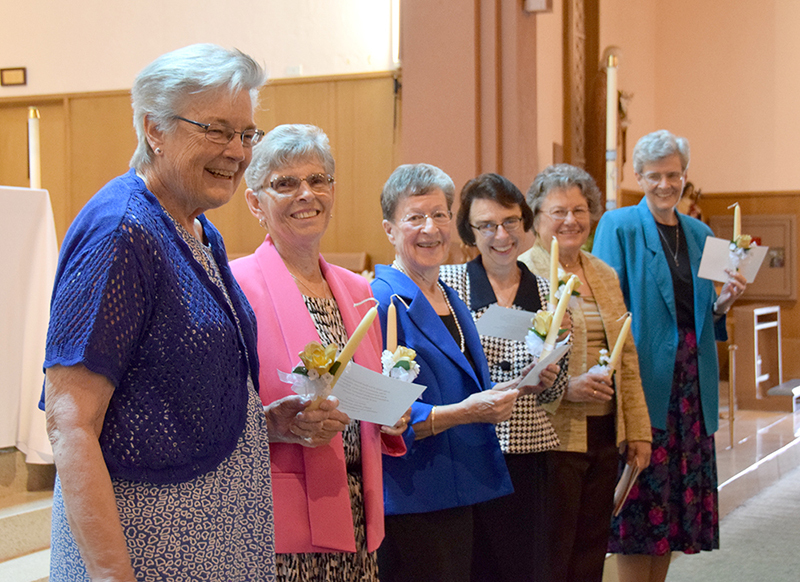 Memories filled the reflections recalled by the Jubilarians, both delightfully humorous and deeply reflective of their 50 years as Sisters of the Holy Names. 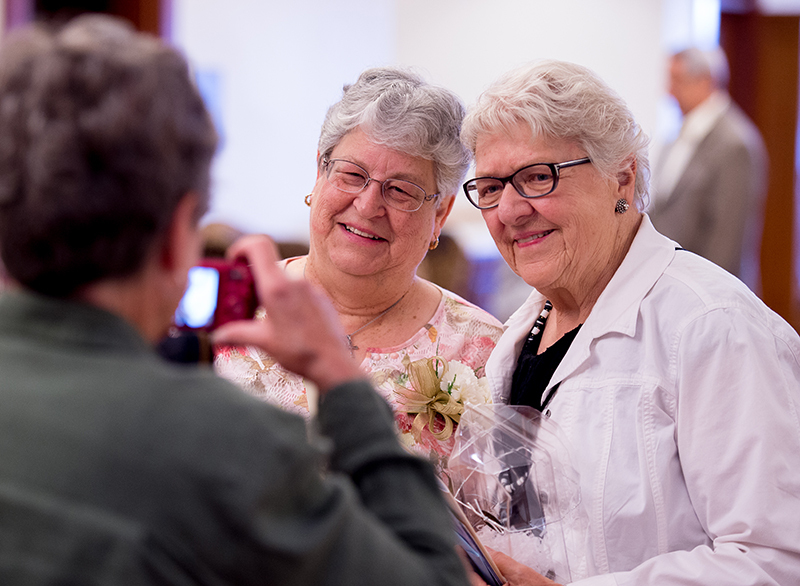 The party continued with a reception at the Holy Names Heritage Center, where hugs and congratulations abounded and gratitude was the word of the day as captured in the Hearthstone each person received as a remembrance of the combined 200 years of love and service lived out by Sisters Moe, Kathryn, Janet and Mary Ann. L-R: Moe Oliver, SNJM, Mary Ann Martinmaas, SNJM, Janet Marcisz, SNJM and Kathryn Knoll, SNJM. Father Richard Berg, Mary Ann Martinmaas, SNJM and Janet Marcisz, SNJM. Back row, L-R: Karen Conlin, SNJM, Makiko Fujiwara, SNJM, Mary Rita Rohde, SNJM and Janet Walton, SNJM. Front now, L-R: Kathleen Ross, SNJM, Judy Ryan, SNJM, Mary C. Boys, SNJM and Miriam Malone, SNJM. 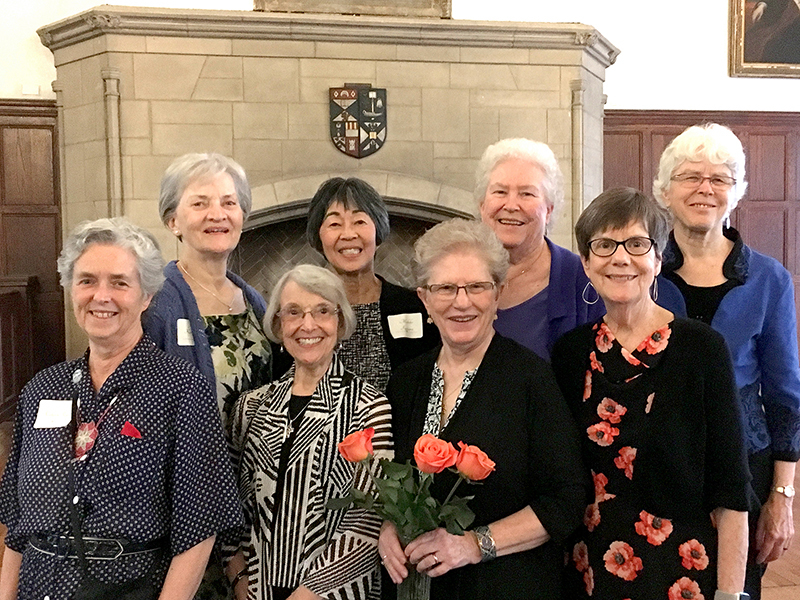 The Golden Jubilee celebration of Mary C. Boys, SNJM (Seattle) at Union Theological Seminary (UTS) in New York City brought together eight Holy Names Sisters from across the country. 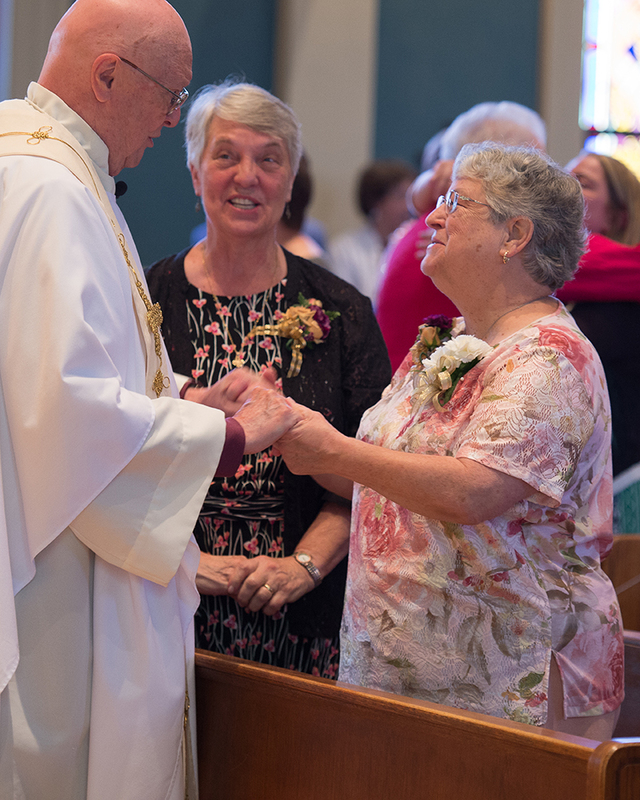 The ecumenical Vespers service, where the Sisters renewed their vows with Mary, welcomed about 80 of Mary’s friends and colleagues from many different religious and professional backgrounds. They all enjoyed getting to meet each other at an elegant reception afterwards in the UTS Refectory, where the picture above was taken. 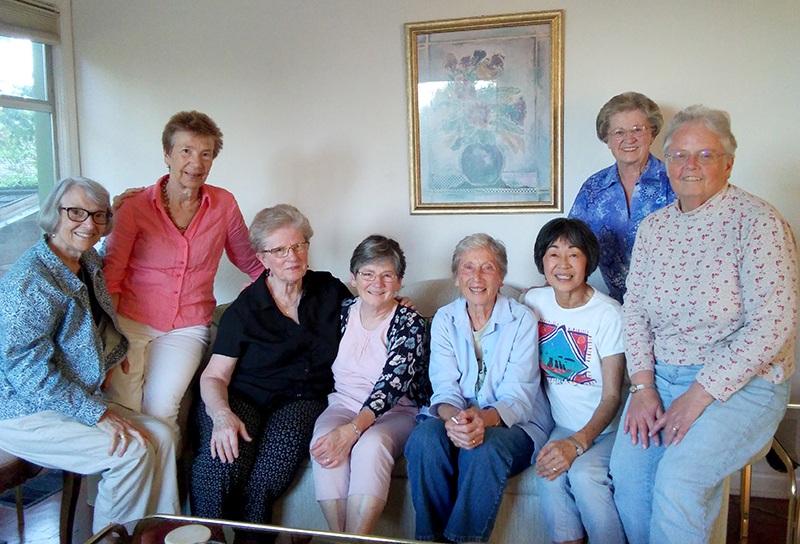 L-R: Judy Ryan, SNJM, Teresa Shields, SNJM, Mary C. Boys, SNJM, Kathleen C. Hilton, SNJM, Kay Burton, SNJM, Makiko Fujiwara, SNJM, Jocie-Rhea Chism, SNJM and Patti Wasson, SNJM.